In the Liturgy of the Word, the vast treasures of the Bible are opened to the faithful like King Solomon’s vaults. The Scriptures—all 73 books in the Bible— are to be loved and venerated, for they prepare us to receive the Word made Flesh. That includes the Old and the New Testaments, so that we may receive the fullness of understanding of who God is and why he sent his only Son into the world as expiation for our sins. The story of the Bible is about the love between God and his chosen people—that’s us—then and there, here and now. Every word—all 800,000 of ‘em—counts. In today’s first reading, taken from the 1st Book of Kings, an historical book, Solomon, the third king of Israel prays to the Lord for wisdom, for an understanding mind, so that he may know how to govern his subjects rightly. Solomon, whose name means ‘peaceable,’ was the son of King David, and was only a boy when he assumed the throne even as his father was dying. Newly crowned the young king felt many emotions but peace was not among them. Like David, Solomon was a writer, and like his father an insomniac. To bore himself to sleep Solomon read his father’s books. Then in a dream the Lord revealed himself to the youth. “Ask anything of me and I will give it to you,” God said. What more could Solomon ask for?—he already inherited the Kingdom of Israel, the most powerful nation in the world at that time, 1,000 years before the birth of Christ. The Lord was pleased that Solomon made this request. Here was a young man who had everything—wealth, prestige and, when he grew up, 700 wives and 300 concubines—and he asked not for more creature comforts (could any other creature be more comfortable?) but for the spiritual gift of a discerning heart. Solomon was very wise indeed. God said, “Because you have asked for this … I give you a heart so wise that there has never been anyone like you up to now, and after you there will come no one to equal you” (1Kgs 3:11a, 12b). Now Solomon was legend. In gratitude to the Lord for the gift of wisdom that he received, the ruler took up his pen and began to write, for through God’s wisdom he became a literary mastermind. Several Old Testament books are attributed to him: The Book of Proverbs, the Book of Wisdom, the Song of Songs, and the Book of Ecclesiastes, an impressive contribution to the portion of the Old Testament called Wisdom Literature. Through his many writings Solomon praised God who imbued him with the true treasure of understanding. I prayed and wisdom was given to me: I pleaded and the spirit of Wisdom came to me; I preferred her to scepter and throne and deemed riches as nothing compared with her (Wis 7:7-12). In Catholic faith Wisdom is one of seven spiritual gifts of the Holy Spirit. She empowers us to know and to understand the plan and purpose that God has for our lives. She helps us to discern our vocation in accordance with our state of life. To seek wisdom is to receive and to understand the Lord’s love and to put our faith and trust in him alone. Pray the Holy Spirit for wisdom; your request will never be turned down. Then you will see the power that comes from God’s grace who is the author of our lives. The proof is in stories like Solomon’s in the Bible. Now some, like my fundamentalist priest acquaintance, may think the Old Testament to be outmoded, difficult to relate to, with the arcane settings and many flat and static characters with names that are difficult to pronounce. The truth is that God drafted only one covenantal story centered on the one single sacrifice of Jesus his Son (Heb 10:12). 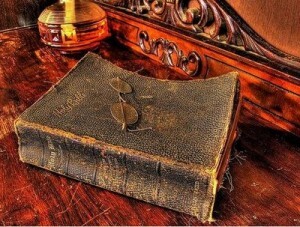 God is the sole author of the greatest best-selling book of all time. From the words “In the beginning” (Gn 1:1) to “Come, Lord Jesus” (Rv 22:20) every word was written with our salvation in mind. It is the greatest story every told. Saint Augustine (d. AD 430), “the doctor of grace,” said that the New Testament is concealed in the Old Testament and the Old Testament is fulfilled in the New Testament. Augustine wrote the words that the Master commanded him to write. The original Word of the Lord rings true: “Do not think I have come to abolish the law. I have come not to abolish but to fulfill” (Mt 5:17). The wealth and power that Solomon inherited from David has become archeology. Ancient history. The true wealth, Christ the power of God and the wisdom of God, Solomon left behind in the sacred books. The Word of God must be the center of our lives to receive the continual influx of the gifts of the Holy Spirit, to receive our portion of God’s wisdom. The Bible is a big book; reading it is challenging, not because of its many words, but we see ourselves on every page of the Good Book. It is our story, but ultimately it is His-Story. By reading the Sacred Page every day we learn more about ourselves because we learn more about “the surpassing knowledge of Jesus Christ” (Phil 3:8). The Bible: B.I.B.L.E. BASIC INSTRUCTIONS BEFORE LEAVING EARTH.